We’d love your help. Let us know what’s wrong with this preview of Love at the 20-Yard Line by Shanna Hatfield. Brody Jackson lives and breathes football as a wide receiver for an arena team. Focused on his aspirations to make the NFL, he’s blindsided by the love that intercepts his plans during the first game of the season. Possessing all the skills and talent to be the best at his game, Brody isn’t properly equipped for the playing field of romance. It’s going to take all he’s got Brody Jackson lives and breathes football as a wide receiver for an arena team. Focused on his aspirations to make the NFL, he’s blindsided by the love that intercepts his plans during the first game of the season. Possessing all the skills and talent to be the best at his game, Brody isn’t properly equipped for the playing field of romance. It’s going to take all he’s got to score a touchdown with love instead of fumbling his chance at winning one sweet girl’s heart. To ask other readers questions about Love at the 20-Yard Line, please sign up. This was a little side diversion for me this week. I'm ahead on my review reading so I've been catching up on some other books I've got stocked up on my Kindle. This is an opposites attract kind of book. Easy reading. Not too much happening other than a growing relationship. LOTS of kissing. I actually thought things dragged a bit in the middle and the story either could have been shorter or something more could have been happening but still, this was a romantic diversion. The characters were easy to like and there was a good sense of family tucked within. You don't have to be a football fan to enjoy LOVE AT THE 20-YARD LINE. I'm not a big sports fan, so when I know a book is centered on a sport, I automatically think the author is going to throw out terms that I don't know and I won't be able to follow the story. This doesn't happen in this book. Yes, football is important in this story, but the storyline was easy to follow and the author did a great job at keeping me interested. Haven and Brody are not out there looking for love, but when they l You don't have to be a football fan to enjoy LOVE AT THE 20-YARD LINE. I'm not a big sports fan, so when I know a book is centered on a sport, I automatically think the author is going to throw out terms that I don't know and I won't be able to follow the story. This doesn't happen in this book. Yes, football is important in this story, but the storyline was easy to follow and the author did a great job at keeping me interested. Haven and Brody are not out there looking for love, but when they least expect it, it sneaks up on them. 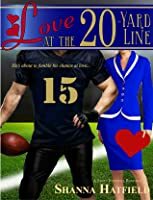 Brody is a football player whose mind is firmly on making the NFL and Haven is a consultant who gets roped into attending the football games for her job. Once Haven and Brody lock eyes, there is an immediate interest in each other. I enjoyed the characters getting to know each other and eventually falling in love. This is a clean romance, so there is no detailed descriptions of them being together, but this book doesn't need all that. Shanna Hatfield did a marvelous job at making me fall in love with her characters and I didn't feel as though I was missing anything. This is Shanna's best book yet. Her characters are a little edgier, and the passion is closer to the surface. Loved Brody and Haven. Would love to see Haven's single brothers find their match. Brody and his football goals and aspirations will he put love on hold to reach his dream? Cute fall for this couple. Always love sincere, honest, genuine characters. They both stumble around a bit, trying to figure out the time limitation on this romance. Their misunderstandings and hurts, along with the well described romantic moments are well-done. Definitely more of a fluff read, so the 3 star, but still a fun light read. I really enjoyed this book. There was lots of laughter, tears and just plan fun. I was happy that is a clean book as well. Way too long and drawn out for me. It was an ok story. If you like football you might like it better. Love at the 20-Yard Line is a sweet, light hearted, standalone, clean sports romance with a HEA! 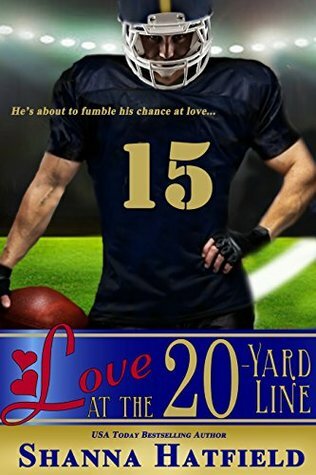 Love at the 20-Yard Line is my first book by Shanna Hatfield and I have to admit I thoroughly enjoyed it. This relatively light hearted romance has just enough tension to keep you addicted and turning the pages without knowing how things would end up between the two characters, Brody and Haven. 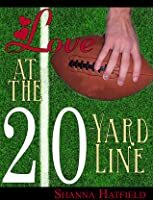 The writing has a serious yet light and witty style at times that fits well with the style of the book and no Love at the 20-Yard Line is a sweet, light hearted, standalone, clean sports romance with a HEA! The writing has a serious yet light and witty style at times that fits well with the style of the book and no major grammatical/spelling errors. It is paced steadily that allows a good development of a relationship between Haven and Brody. There are no sexually explicit scenes, although there are adult undertones throughout but if you are looking for a steamy romance, this book is what I would deem a ‘clean’ romance. Haven is fairly naive and innocent while Brody comes from a tougher background but these two contrasting characters fitted perfectly together. I loved the interaction and use of Haven’s family not only with Haven but also with Brody. The use of dual points of views allowed the story to play out from both characters, adding more to the understanding of the readers about each character. This is a clean, entertaining and heartwarming story about opposites attracting. It truly is a sweet football romance. Haven and Brody make an awesome couple. The relationship between Haven and her family is very true to life. The interactions between siblings remind me of my own family. When Brody really leaves it is heartbreaking. It is rare to find a story that shows real life situations. Great writing. A Sweet and Clean Romance! Love at the 20-Yard Line is a sweet and clean contemporary romance novel. I enjoyed reading about Haven and Brody and their relationship. Shanna does a wonderful job of bringing in a number of other characters that add humor and depth to the story. A fun, easy read that was difficult to put down and left a smile on my face. I like it. It sure keep me reading because I couldn't wait to find out what happened next. I didn't like that we didn't get to hear how Brody really did in the NFL and that we didn't get to hear more about the second half of their lives. This was a cute, quick read. Even if you are not a big football fan, there is plenty in Love at the 20-Yard Line for you to enjoy. Neither Haven nor Brody are looking for love, but it finds them anyway in this sweet story from Shanna Hatfield. This is a light-hearted, clean romance that will keep you entertained for an afternoon or evening. I would love to read Haven’s brother Hale’s story. I am not a sports fan, never ever watch on TV, or live. But then, I absolutely love,love, love books and movies centered around sports, any sport. This was a sweet, enticing book and I highly recommend. Loved it! The author lures right in with a great heroine and hero. And fun premise. And great supporting characters. There is just enough angst and not too many painful misunderstandings. The romance is good and clean! I really enjoyed this book. I enjoy all of Shanna Hatfield's books and this is no exception I am looking forward to her next book. Shanna Hatfield just has a way of making her characters come alive so I just drop down inside the book and get attached to them. Another cute, clean romance. I like the storyline, thought it was a good read, but felt the end was rushed. Could have used another 15 pages or so to close it out.